I live a few miles west of Kennesaw Mountain, smack in the middle of the route which Union and Confederate armies took as they battled their way from Chattanooga to Atlanta. The area around my house (about a 5 mile radius) is covered with Georgia State Historical Markers noting places of significance in the half dozen or so major battles that took place there in the spring and summer of 1864. 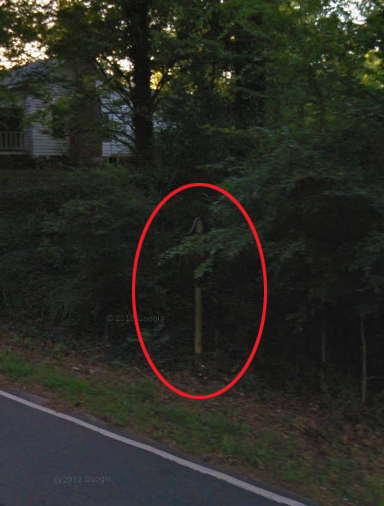 I learned from one of these markers that a nearby house, served as the last headquarters of Confederate general, Leonidas Polk. I had previously read-up about Polk’s life and career after learning he had been killed during the war at a location about 2 miles from my house. One evening while stuck in traffic, about one quarter of a mile west on the same road as, and in sight of, Polk’s final headquarters, I happened to notice a historical marker I had never seen (at the time the marker was overgrown with vines). The plaque noted the site had been used as a headquarters by Union general Oliver O. Howard a few days after Polk’s death and a few days before the Battle of Kennesaw Mountain. I didn’t think much about the sign or it’s significance, I was familiar with Howard as a general, but really knew no specifics about his life before or after the war. Polk was born in Raleigh, North Carolina to a prosperous planter family which owned numerous slaves (some sources indicate several hundred). Howard was born in Leeds, Maine and, prior to West Point, attended Bowdoin College, one of the major centers of the abolition movement (Harriet Beecher Stowe wrote Uncle Tom’s Cabin on the campus of the college). Polk graduated in 1827, 8th out of a class of 38. Howard graduated 1857, 4th out of a class of 46. Polk resigned his brevet lieutenant commission six months after graduation to attend the Virginia Theological Seminary to become an Episcopal minister. Howard converted to evangelical Christianity shortly after his first posting and considered resigning his lieutenant commission to become a minister. Polk was known as “The Fighting Bishop” (he had been the Episcopal Bishop for the state of Louisiana before the war) and was adored by the troops under his command. Howard was known as “The Christian General” a name that was rarely used without derision. Polk founded University of the South – known as “Sewanne” (in Sewanee, Tennessee) which he intended to become the Oxford University of the Southern U.S.
Howard founded Howard University in 1867 to provide college education for freed slaves. 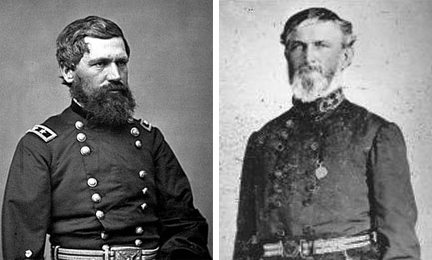 Neither Polk nor Howard were highly regarded by their contemporaries (or by modern military historians) for the military skills. Polk was killed before the end of the war when a shell fired by the 5th Indiana Light Artillery nearly blew him in half. The battery was part of the 4th Corps, commanded by General Howard. Howard survived the war and went on to become the first commissioner of the Freedmen’s Bureau, and agency created to help recently freed slaves. Although Howard was sympathetic to the plight of slaves, he did share the same sentiment with Native Americans. In particular, he disregarded long-standing treaties and forced the surrender of the Nez Perce indians onto a small reservation. Interesting that Howard was sympathetic to slaves, yet not to Native Americans. Jefferson was the opposite. He thought Native Americans a noble people to be respected. Yet when it came to slaves, he did not make similar comparisons. He had sympathy for their plight (and the moral implications of their treatment) but that was about as far as it went.